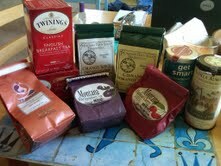 I am completely, fully, and unequivocally addicted to tea…please see my tea stash above. I very rarely drink herbal tea (but I have two in the stash) and I, 99% of the time, drink black tea. This shouldn’t be a problem except that I drink black tea British style = cream and sugar. I use 2% evaporated milk and a teaspoon of brown sugar but the evap. milk still has plenty calories; I would not be surprised if my tea has at least 150-200 calories. Next time I drink tea, I’ll measure just how much milk I use so I can get an accurate count of my calories. I will never give up tea though…NEVER.